Here I am entering the town forest. Yes, that is Route 128 North to my right; the southbound lane is to my left just out of view. So that means… the town forest is on the median strip? Yes it is. The gate I am entering is located on the newly reconstructed Washington Street overpass, across from Mary Hartigan’s…etc. The land was taken by the state in the 1950’s when Rte. 128 was built. In 1972, State Representative Charlie McGowan completed legislation that deeded the land back to the town. 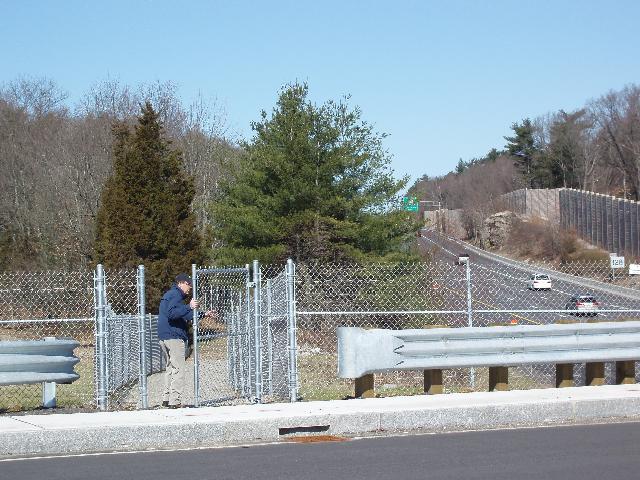 He hoped that trails would be developed on the property and that residents would use it for hiking and picnicking. My feeling is that it never really caught on as a recreational area, and my friend Jim believes that some people found a more nefarious use for the isolated spot (see comment on yesterday’s post). 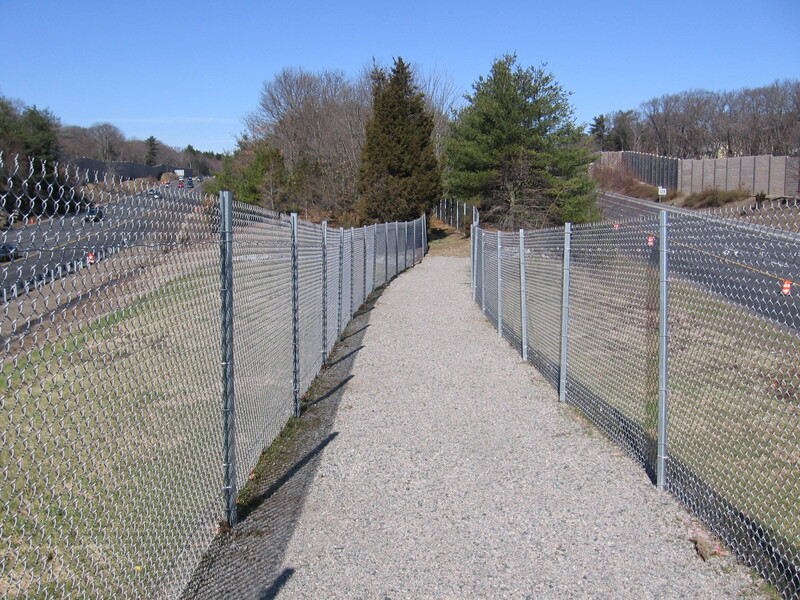 The fence runs about a thousand feet down a narrow corridor, and the land then opens up into a much wider woods. Even with the trees still bare, once you are inside the woods you don’t really see the highway; but you can certainly hear it. Check out the satellite view on Google maps (which does label it as the Dedham Town Forest). It really is a pretty big piece of land, extending all the way to Rte 109. So the next time someone tells you to “go play in traffic,” you’ll know where to go. This entry was posted on March 21, 2011 at 7:35 pm and is filed under Lost Dedham. You can subscribe via RSS 2.0 feed to this post's comments. You can comment below, or link to this permanent URL from your own site. It almost looks like the entrance to the jail. If it was bio-hazard you found go wash your hands. Not bio-hazard, strictly speaking. But it did have 6 legs. Just one, but that’s all it takes. Pleased to find this blog! I just moved to Dedham and I’m keen to learn about its natural history and the town history. I’m in East Dedham, just over the hill from Fairview Cemetery. I suspect the hill is a former quarry (a missed opportunity if not, judging by the ample supply of Dedham granite in and around my yard!) but I’d be curious if you knew! Just posted a few pictures to my own blog, from a recent visit to Mother Brook behind the East Dedham Plaza. Welcome to Dedham, and Dedham Tales! Dedham has quite a history and I’m trying to make the quirkier aspects of that history available to all, thus the blog and the book. There is a chapter in the book (see Blog post May 10, 2010) about Dedham granite, much of which was quarried in what is now Westwood in the 109/128 area. Thanks for checking it out! Hi James,Just came across your Dedham Tales Site yesterday.What a kick ! Delighted to see you having taken this blast from our past(Dedham/History)on.I am a Dedham native as well as my Irish Immigrant grandparents.Perhaps your family knew my Aunt Peg(Margaret M.)Riley who lived her entire career at Dedham Institution For Savings;eventually as Vice President and Treasurer of said local banking institution.From what I would guess,The Riley family’s home(my grandparents and the rest of us,including Aunt Peg)resided at 386 Westfield Street on Weld Pond.Now,I used to pick blueberry’s as a kid at the end of Westfield Street,roughly 3-4 residences up from us where Westfield Street ended.And,from memory,128 was not far from the end of Westfield.Is that correct ? I would on occasion cross the highway to go to Dedham Country and Polo Club.Is that area part of/in the Dedham Town Forest?Thanks James for doing this.There’s plenty of amazing and sordid history there. Best Regards,Tom Riley,Jr. Class of 1966/Scituate H.S. and resident of Marin County/Northern California. GO SOX-Celts-Bruskies ! Tom- I’m glad you found the blog and had some fun reading about old Shiretown. Check out the Town Forest on a Google map- it sits south of 109 and Westfield St. There is a small portion of it at the end of Sandy Valley Rd. Growing up on Westfield St., are you familiar with the legend of “The Gates,” or “Hammer Rd.” as some call it? Hi, thanks for sharing your findings! I grew up on Chickering Rd, the “last street” in Dedham before Islington- across from Westwood Furniture. We would venture into the median strip quite a bit – using the same path described in your blog. There is actually a strange little shelter thing made out of rocks on the north facing traffic side just bit after you enter the path. It has a cement roof also. . .strange. So a bit of history. . . there were definitely some farmed fields nearby. In fact right around the bottom of Chickering Road and where 128 is now- there was a farm that was turned into a 1/2 house for women coming out of prison in the (aprox.) 1870s- 1900. It was a social experiment kind of project thought of and run by Helen (I think her name was Helen) Chickering . Women were sent there to live for a bit after they got out of prison in Framingham. There remains a piece of evidence of the farm still. Drive up Chickering Road and turn right at Pond Farm Road and drive to the end (a very short dead end street which ends at a fence facing 128). Next to the last house on the left facing the bottom of the street, is a tree with about 10 little headstones. It is a cemetery for babies who died around 1880’s. I think these babies -all with different last names, could be from some of these women or other folks who lived on that farm. by the way, the cemetery is kind of in these people yard. but I read that it is actually town property. If anyone knows more about any of this, I would enjoy reading about it. I’ll check to see if the headstones are there. I happen to walk the dogs who live there, so I know they won’t mind if I go look. So interesting! ! I once entered what I later found out to be the Town Forest from Sandy Valley Road off Gay St. in Westwood. I was curious that there was a Sandy Valley Road in Westwood and couldn’t imagine that it connected to the Sandy Valley Road in Dedham. Of course, 128 broke the connection but the story of trying to get my car out of the forest’s swamp lives on. Visited the Town Forest myself today, thanks in part to your story. I was glad to see it, but i can’t say I found it aesthetically very pleasing. For one thing, the highway noise is very unpleasant in places, especially near the southern end (where you enter). And as a word of advice to others, there is no obvious path all the way through (or at least, i could not follow it after a certain point). You can’t get lost, but the walking can involve navigating some undergrowth. And it gets steep in places. So I advise boots (I had only sneakers and wished I had boots). i was not able to go all the way to the northerly boundary — I ran out of time. Does it get nicer as one walks further north? My photos of the woods are at http://www.flickr.com/photos/motherbrookman/sets/72157631993878194/with/8180217013/. Hey David(Bryant) and Jim(Parr) ! Great photo’s ! If only the “trees and rocks” could talk about what they’ve “seen and heard” in the Dedham Town Forest ! Best Regards, Tom Riley/Kentfield/Marin County,Ca. and former 18 year resident of Dedham & Scituate,Ma.